Loxone Tree offers full flexibility for designing the wiring of your home. The Tree Extension has two ‘branches’ and up to 50 Tree enabled devices can be connected to each branch, allowing you to create a customized wiring structure that’s suited to the size of your home and tailored to your needs. Tree Technology marks a new era for the Loxone Smart Home, offering a simplified wiring system that allows for streamlined installation and configuration, yet remains flexible and expandable. 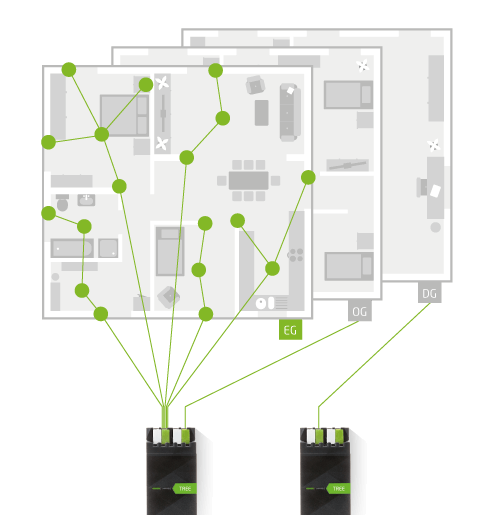 Thanks to the flexibility of Loxone Tree, cabling requirements can be reduced by up 80%. The configuration of Tree devices in Loxone Config is streamlined and efficient. As always, the hardware and software for Tree have been developed in-house to ensure full compatibility with other Loxone components. With Loxone Valve Actuators, every room can be set to a different temperature, and unlike a smart thermostat, each and every room in your home can be controlled independently of the other, meaning even bigger savings on your heating bill! The all-in-one cable for Tree devices - whether that’s motion sensors, switches or spots. With the new Tree Cable, we’re continuing to improve the ease-of-install of a Real Smart Home. With the Loxone Motion Sensor, your Loxone Smart Home can reliably detect motion and brightness. As one of the most important sensors in the smart home, it provides information for useful features like alarms, lighting and energy saving.